We offer Poglia Signature Sets to select clients interested in a high- end, custom experience. 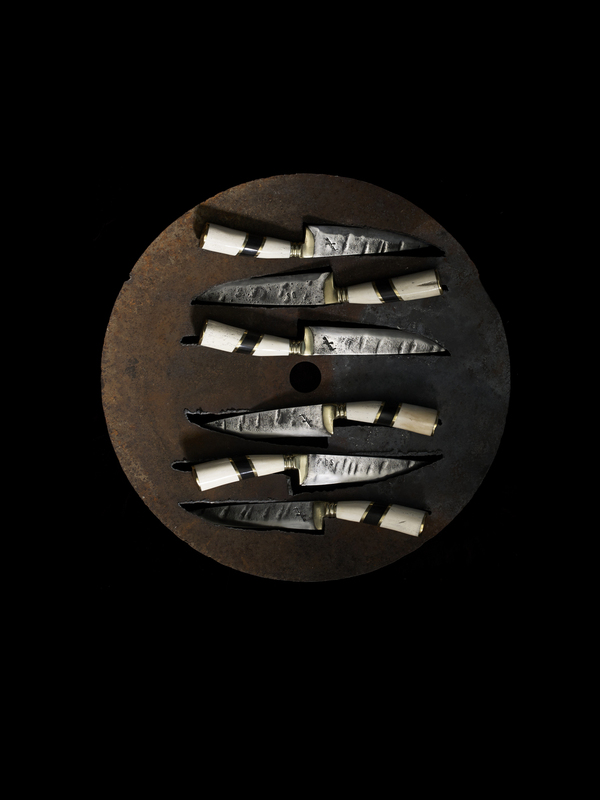 Each custom set comes with the "plow disk skeleton" from which each knife is individually cut. The carbon steel disk is a one-of-a-kind artwork that serves as a memory of the blades' rustic past and of rugged simplicity. Clients may incorporate their choice of two natural materials (horn, bone, and wood) and we can add hand-hammered, custom initials on the blade during the forging process. Each knife is finished with solid brass. To inquire about our custom sets, please write to hello@poglia.co. We work with a 3+ month waiting list for custom projects. *Due to limitations of the natural materials, some restrictions may apply.